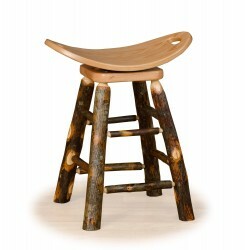 Lots of western charm with this rustic hickory log stool! Simple rustic elegance is perfect for a bar or kitchen area in any home looking to add a twist. Choose from Oak or Hickory for the seat and choose Counter or Bar Height. *PICTURED IN HICKORY ON HICKORY. Bring the natural beauty of solid hickory logs to your kitchen or bar area. Each chair is custom made in the USA by skilled Amish craftsmen. The Solid wood seat is available in Hickory or Oak. Either option is a great choice for a piece which is sure to last for ages. A great decor style for a rustic log cabin, mountain lodge, or country house. Ships via FedEx Ground. Basic Assembly Required.